Your path towards weight loss and a healthy lifestyle starts in the kitchen. 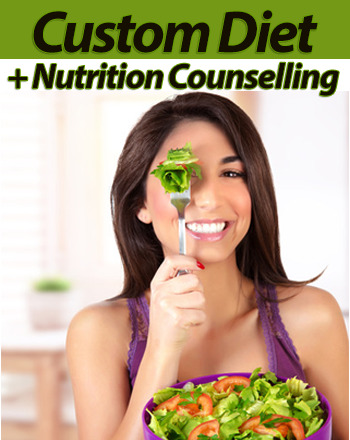 Sign up for nutrition counselling sessions with our Registered Dietitian and overcome any types of cravings, fit your diet plan into your daily routine and enjoy feeling and looking healthy year round! - Initial Assessment & Diet Plan: Meeting with your dietitian including a full assessment: body fat percentage and circumference measurements, lifestyle assessment, medical history review, identifying dietary restrictions and sensitivities determining strengths and weaknesses, setting goals and an initial diet plan. - 2 (30 minute) follow up sessions: progress assessment (including measurements), introducing changes to your diet plan and identifying and resolving barriers. Scheduled approximately every one or two weeks apart.